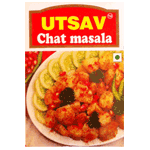 Chat Masala is a masala, or spice mix, used in Pakistani and Indian Cuisine. It typically consists of amchoor (dried mango powder), cumin, kala namak (black salt), coriander, dried ginger, salt, black pepper, asafoetida (hing) and chili powder. Zingy, tangy, slightly hot Chaat masala is the perfect seasoning! Though often used as a spice in cooking, Chaat Masala is mostly used as a garnish on salads, Chaats (a generic name for hot, tangy, sweet nibbles), drinks (like Indian lemonade! ), curries and daals. Product of India.